Physician Burnout: Tips to Combat Stress. If you are like many health professionals, you spend all day caring for others and often forget to take care of yourself. Long hours, demanding schedules and significant stress can wear away at even the best of us overtime. 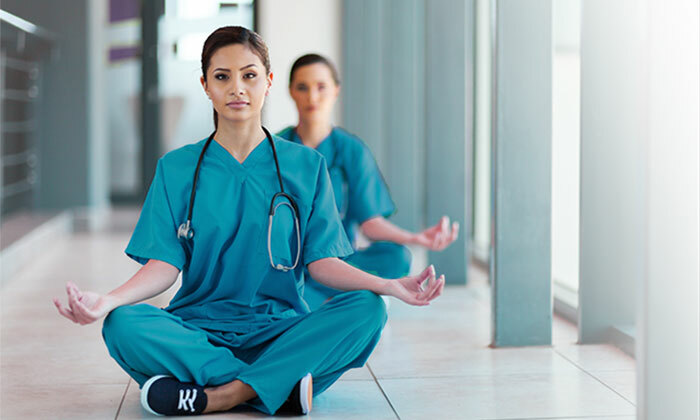 Whether you are seasoned Physician or a sleep deprived Resident there are some simple strategies you can employ to decrease your stress and prevent burnout. Give Yourself a "Time Out"
Try establishing timed breaks throughout the day. Pick an interval of time and how often it will occur. For example, after every 6 patients you will take a 5 minute break. Be sure to be consistent. It is important that you stick to your schedule in order to reap the benefits. Allowing yourself a few quick breaks throughout the day can help you decompress and remain focused while working. You spend your career espousing the benefits of exercise to your patients, so why not take your own advice. Make sure to take some time out and make exercise a priority. If you are exhausted after work and the idea of exercising seems impossible try doing it in the morning before rounds or the start of clinic. If your schedule doesn't allow for a morning at the gym, try adding interval exercises spaced throughout the day to increase your overall activity levels. Some examples you could try include running up the stairs, wall sits, chair dips, burpees or mountain climbers. There are many physical, cognitive and emotional benefits to practicing meditation and mindfulness. Even if you only have a few minutes a day to practice these techniques, they have been shown to improve mood and decrease anxiety and fatigue(1). Start by practicing for a few minutes a day and gradually increase the duration of your practice with each passing week. Meditation and mindfulness can be practiced anywhere and can be especially beneficial at work to decompress during breaks. Many find it challenging at first to shut down all the outside distractions or nagging thoughts that may pop into their mind. If this is the case for you, try a guided mediation or mindfulness app on your mobile device. There are various applications and podcasts that can be found on iTunes or at the Google store that may be a good fit. It may sound simple but we know in medicine it's common to either eat on the go or miss meals all together while working. To increase the likelihood that you make this happen, bring your lunch and be sure to make it simple. Skip the elaborate heat-and-eat 3 courses. Establish a time, even if it's only 15 minutes, to sit a nd eat your lunch. The act of giving yourself a simple meal can reinvigorate you for the second half of the day while giving you some much needed mental downtime. It is essential to ask yourself what is at the core of your stress. Are you unhappy because you lack family time or are stuck in an unfulfilling job? Are there personal or family health issues like caring for aging parents or a divorce adding to your stress? Identifying the origins of your stress can help you find the right solution. If you are feeling unfulfilled in your job, consider how changing locations or pursuing some side work might mix things up for you. Perhaps you will feel more fulfilled volunteering in a community clinic, moonlighting at another job or working a nonclinical side gig. To maximize your work-life balance consider transitioning to part time work or job sharing with another Physician. If your feelings of stress are overwhelming or affecting your work or personal life, consider talking to a Mental Health Professional. According to the American Foundation for Suicide Prevention, 300-400 Physicians a year die by suicide(2). When it comes to female Physicians the statistics are even more alarming. Female Physicians are 250-400% more likely to die by suicide than women in other professions (1). It is essential to practice self care and address stress and feelings of burnout before they become overwhelming. (1)	Zeidan, F. et al. "Mindfulness meditation improves cognition: Evidence of brief mental training" Consciousness and Cognition. Volume 19:2, June 2010, Pages 597–605. (2) "Physician and Medical Student Suicide Prevention". American Foundation for Suicide Prevention. Accessed 11/27/16.